Desiree Hartsock and Chris Siegfried announce their wedding date. Photo courtesy of Desiree Hartsock's Instagram. The wedding bells are getting louder for one of our favorite Bachelorette couples! According to Wetpaint.com, Desiree Hartsock and Chris Siegfried hinted at a January 2015 wedding for months but only just confirmed the big news. The pair created an adorable save the date video on Instagram that featured some of their cutest pictures. 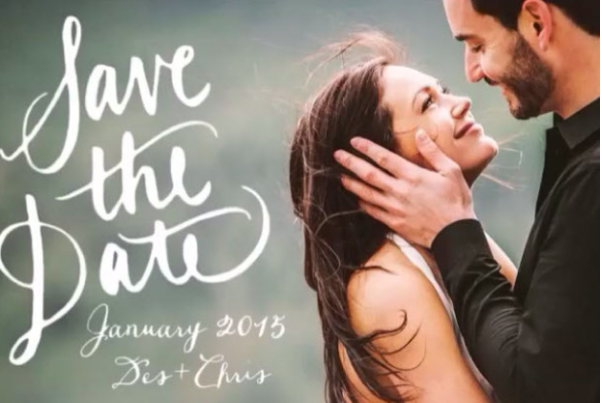 The clip, which was posted by Hartsock, was overlaid with the text: “Save the Date: January 2015 Des + Chris.” Hartsock then added a caption to the slideshow, writing, “It has been one incredible journey with the love of my life thus far but I cannot wait to marry him and start another chapter! I love you so much!! #savethedate #secretsout #goingtothechapel with @chrisrsiegfried @seahawks #flipagram Music: The Avett Brothers – I and Love and You.” This winter wedding will be one to remember! What are three unique ways to announce your wedding date? 1. Photo strip bookmarks: Find a local place to take pictures in a photo booth with your fiancé. Take the photos while holding up cute signs with details of your wedding. You can include only the date or add the location if you’ve made more definite plans. Make as many copies as needed and send them to all of your friends and family so they can “mark” the event on their calendars! 2. Match books: Get custom-made matchboxes that have the date of your wedding written on them. You can also put a cute phrase on the box that goes with your theme — something like, “Get ready to see sparks fly!” Not only is this idea adorable, but it’s super easy. Check out Etsy and Pinterest for more inspiration. 3. Put it on film: If you and your partner want to go a more extravagant route, produce your own save the date video. Work with someone who knows about cinematography and show your love story on film with the ending revealing your wedding date. Send the video out to your guests via e-mail. What are some other unique wedding announcements that you love? Share your ideas with us below!